A lone figure stood high up in the central spire of Vienna’s Rathaus. At the observation window above the enormous illuminated clock, he surveyed the city he ruled, feeling the juddering thud of each minute’s passing in the mechanism beneath his feet. For a time, he watched the docile Viennese plod about their business this brutally cold afternoon of the last day of January. The skies were clear, brittle blue, and afforded a view to the northwest of the Vienna Woods, flecked in snow. Slowly, menacingly, he allowed his eyes to move to the far left middle distance. There stood the twin towers of the Votivkirche, which he regarded as an open insult to him. This was the devotional church to the emperor, Franz Josef, built to commemorate the occasion when the young emperor survived an assassin’s knife. Doktor Karl Lueger, mayor of Vienna for three years, and something of a king himself, scowled as he gazed at the emperor’s church. He and Franz Josef were old enemies; thrice had the Habsburg denied Lueger his place as mayor, even after the Viennese had resoundingly elected him. 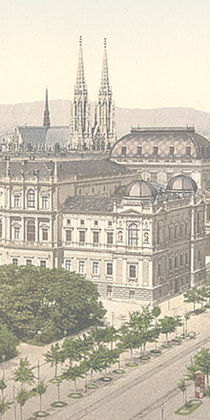 Three times Franz Josef had felt it his solemn duty to save the Viennese from themselves. The old fool had the effrontery to call me a demagogue, Lueger thought. Me, a man of the people who simply takes to heart the plight of the little man and the true Christian in this mongrelized empire. He made an audible snort. Kulowski, Lueger’s beefy bodyguard, looked expectantly up at him from the bottom of the last flight of stairs. Lueger shook his head dismissively at the man. Of course everything is not all right, you dolt, he wanted to say. As long as there is a Habsburg left in Vienna, things will never be right. Soon, however, very soon, things would be set right. As he was accustomed to doing, he threw open the observation window on the tower, breathing in the crisp air. He could smell the scent of black pine and the sweetness of snow. Beneath, on the Ringstrasse, a solitary D streetcar, pulled by a dappled mare, was making its way to Schottentor. A new motorcar suddenly passed it, causing the horse a sudden fright, but the skilled tram driver soon brought the animal under control. Another tradition: Lueger gathered a gob of saliva in his mouth and spat in the direction of the Votivkirche. It would fall to earth as a snowflake, he thought. Then he closed the observation window. The world was changing. Here we are in the first year of the twentieth century. Motorcars will be the future of transport. The city is growing at an astounding rate; soon it will finger off into the hills of the sacrosanct Vienna Woods. Now, as the day began to dim, electric streetlights along the Ringstrasse flickered on. Away with gas lighting and horse-drawn equipages – all remnants of an old and tired world. Even the holy shrine of the Vienna Woods could not stop the steady thrum of progress. Lueger, at fifty-five, felt himself very much a part of the new century, not the old one. He did not wax nostalgic over that which might be lost with modernization, unlike the stodgy emperor who refused even to ride in a motorcar and intensely disliked the telephone. ‘Your five o’clock appointment,’ Kulowski called up the stairs to him. Damn the man, Lueger thought. Still, it would not do to the keep the ward boss of the Third District waiting too long. He no longer carried himself with the same bounce as of old. Mentally he felt younger than ever, and his face was still as handsome as when he was a young man. Thanks to his good looks, he had mobilized the Gretl brigade, or the Amazons, as people called his ardent female supporters. Though these women did not have the vote, they idolized him and in turn enlisted their husbands and male relatives. They still remained his most ardent followers, dubbing him ‘Handsome Karl’. Physically, however, Lueger was beginning to suffer the outward signs of diabetes and nephritis. His illness was still a closely guarded secret, but he doubted it could remain so for long. Climbing the three hundred and thirty-one steps up to the top of the Rathaus was no longer an easy task for him; as a result, he restricted these visits to once weekly. It was worth the effort: to view the world beneath him like this, his personal fiefdom. And before long he would not have to share it with his old nemesis, Franz Josef. He was smiling so broadly when he reached Kulowski, that the bodyguard wondered what the mayor was up to. It was the grin of an imp, of a man scheming and damned pleased with himself. But Lueger ignored him, gripping the handrail as he continued descending. Going down was worse than going up; perhaps he would have an electric lift installed? After all, he could put the expense down to advocating tourism. Not that he would allow the hoi polloi to ride his elevator, but it would make a fine excuse for funding from the City Council. Lueger took his mind off the descent by going over the points he would need to cover in his upcoming meeting. His backers in the Third District were getting restless. And by ‘backers’ he did not mean the Marias and Josephs with their tiny corner Lebensmittel or Bäckerei who thought they were the mayor’s special cause. No. His real backers were the landlords who had put millions into his campaigns and were still waiting for some results for their money. They had reached the bottom of the spire stairs, contiguous with the upper floor of offices, when they heard the shot. Not a military man, still Lueger knew for a certainty it was a gunshot. So did his bodyguard. Kulowski attempted to grab him from behind and throw him to the parquet of the corridor to protect him. Kulowski looked at the mayor quizzically for a moment before he realized the shot was, in fact, nowhere near them. Footsteps were pounding along the corridors, followed by excited voices. They followed the throng of people to the southwest corner office. They could now see that the crush of city workers and other councilmen had gathered at Councilman Reinhold Steinwitz’s door; a hush such as at a funeral had fallen over them. Lueger looked to the crowd of people and then beyond; Kulowski followed his gaze. When the bodyguard looked back to the mayor, Lueger wore a shrewd grin on his face. The architect Otto Wagner, who had reached the office first and halted at the entrance, aghast at what he saw, now pushed his way back through the crowd. There was the harsh smell of cordite in the air, and Oberbaurat Wagner, despite being nattily attired in his frock coat, was not looking very professorial, Lueger thought. His eyes were wide and there was a nervous urgency about the man that the mayor, who had employed him on municipal projects from regulating the Danube Canal to building the metropolitan railway, the Stadtbahn, had never before seen. Finally Wagner saw Lueger and rushed to his side.